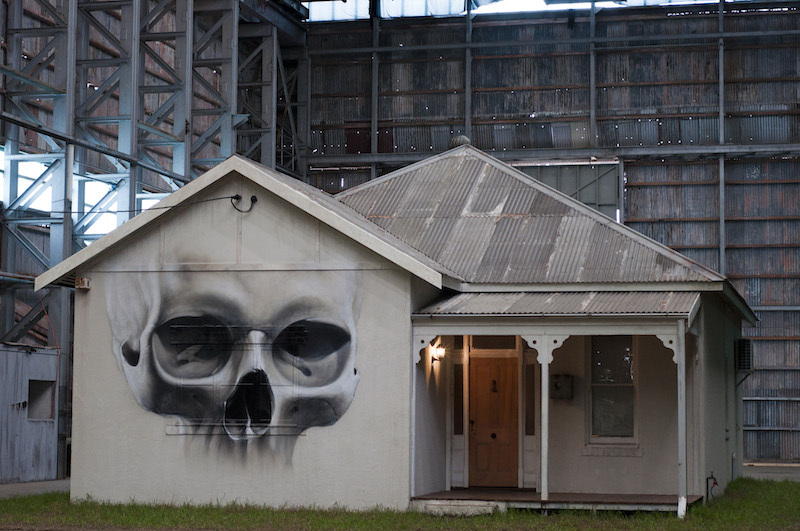 Ian Strange aka Kid Zoom’s installation at Cockatoo Island in Sydney, Australia in 2011. Photo by Scott Brown. Documentation and the web have played critical roles for Ian Strange aka Kid Zoom throughout his art career, and it now explicitly influences his art. In the Australian city of Perth where Strange grew up and began doing graffiti as a teenager, graffiti typically only lasts a few days, so it was essential for Strange to photos of his work from the beginning. And even in his early years, Strange was looking beyond Perth for graffiti. He also read graffiti magazines and checked the website Art Crimes. His dream was to have his work featured in one of those magazines or on Art Crimes. In the mid-2000’s, street artists and graffiti writers began to establish Myspace pages and eventually Flickr accounts. For Strange, the world got smaller and Perth didn’t seem so isolated. He says, “Suddenly, instead of having conversations and competing with the guy down the road, you’re doing that with some of the best artists around the world.” It was through Myspace that Strange connected with the Everfresh Crew and other artists in Melbourne, who eventually got him into group shows there. For Strange, the shows were a reason to fly to Melbourne, paint, and meet people. During those first shows in Melbourne, Strange was still an unfamiliar face. On more than one occasion, he sent art to shows curated by people who had only seen his work as jpeg images. While some artists are hesitant to acknowledge the importance of the documentation and distribution to their work, Strange is happy to discuss it, stating, “More and more, distribution of the image is the most important thing. If you’re an artist, you’re a visual communicator, and if you’re communicating visually, you wanna be able to delineate your work as far as you can. To be able to get more eyes seeing it creates more awareness which creates more interest in your work.” Although Strange isn’t generally recognized as a social media guru, he is more comfortable than most with the idea that a major audience for his paintings is the Bored At Work Network, who look at jpeg versions of his work.